Google used its 20th birthday celebration to unveil a number of new features – with a big focus on the user search journey and the content that they consume. As Google celebrated its two decade anniversary last week and, whilst the birthday celebrations were somewhat subdued by the search engine’s usual standard, there were some interesting announcements regarding how Google plans to “join up” the user search journey – particularly for high consideration purchases. Google revealed that it wanted to take what it hard discovered from 20 years of our search habits, unveiling that it would be using artificial intelligence to make the search experience much more personal. Not only would it try to personalise the user search journey based on a user’s previous activity, but it would also make search results much more reflective of where a user is in the purchasing journey, and try to predict what they are going to look for next. Google used the landmark date to echo comments made by Microsoft many years ago and state that search was not a “one off” event, but a series of multiple queries made over many different sessions. The theory is that particularly in searches where there is a large amount of consideration behind the purchase – such as high value items or major life events (weddings or holidays for example), users will search multiple ‘sub topics’ within that niche. So for example, a user searching for a holiday to the Caribbean may follow up that initial query with search for particular islands in the Caribbean, they may search for weather information, particular attractions, rental cars, flight deals, airport parking and recommended restaurants – all under that one “search journey”. Google believes that it can use AI to better ‘join up’ that search journey, by allowing to users to pick up their journey where they left off, and by predicting what the user will search for next. 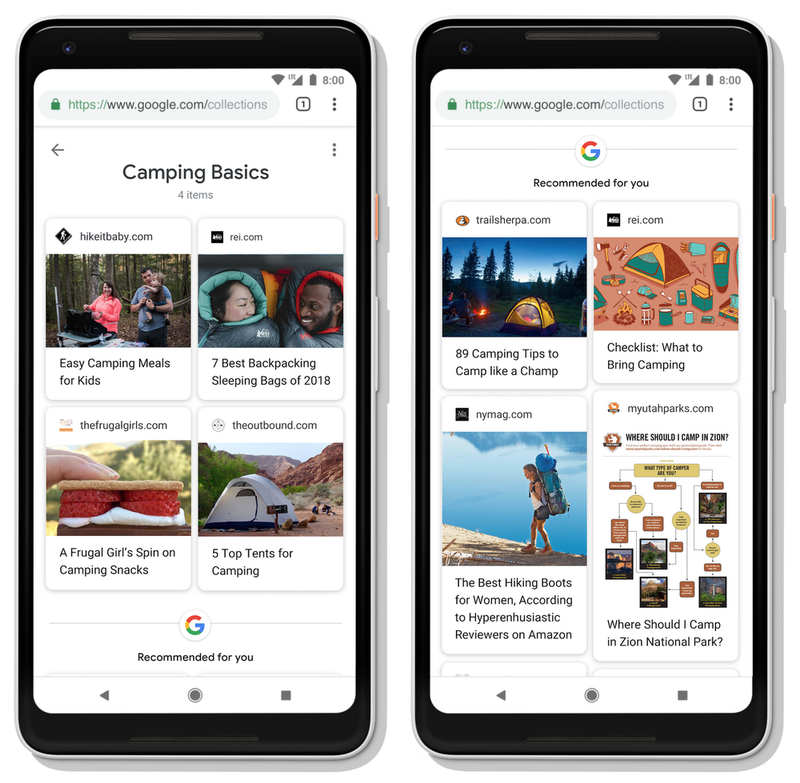 To achieve that, Google unveiled two new features that will be introduced to the search results; activity cards and collections. Activity cards will be designed to allow users to “pick up where they left off” in search, showing them the previous pages and sites that they visited, along with previous queries. They won’t appear every time and for every query, and users who were using a shared computer to research a surprise gift for a family member will be able to edit and remove the results. Collections is more of an update than a fresh idea – they have already existed even if the usage of them by users isn’t publically known – but it will allow users to save content from Google onto their phones. Google says that it will now be able to start offering suggestions based on the content of these collections. Topic layer is also coming to Google search, and this what will attempt to recommend new content to the user on those longer search journeys. So what does that mean for my content strategy? Let’s focus on those three key terms in the Google statement – “relevant”, “evergreen” and “continually useful”. The recent ‘EAT’ update has put a sharper focus on issues such as content expertise, authority and trust – particularly in the ‘YMYL’ (Your money, your life) markets that Google appears to be hinting at here. Now, in addition to these, Google appears to be looking at longer-term factors of content longevity, audience value and relevance. What should we read into that? Well, your editorial calendar has suddenly become more important, as has your longer-term content marketing strategy. Google’s changes in this area are all about forcing the issue that brands need to develop content strategies for consumers, for the journeys that they go on and for the queries that they need answers to. That means that as a brand, you need to think about the content assets that you currently have, and how you are using them. Are they still relevant for your audiences’ needs today? Will the still be relevant tomorrow? If not, update them. What questions are your audiences asking you? Reflect that in your content, and do it in a way that has long-term relevance, rather than producing something ad-hoc that will only serve a short-term purpose. And get the technical aspects of content discovery right. If Google is looking to ‘join the dots’ in the search easy, make it easy for Google to identify which content assets are connected to which. which channels you should use to put your content in front of your target audience. 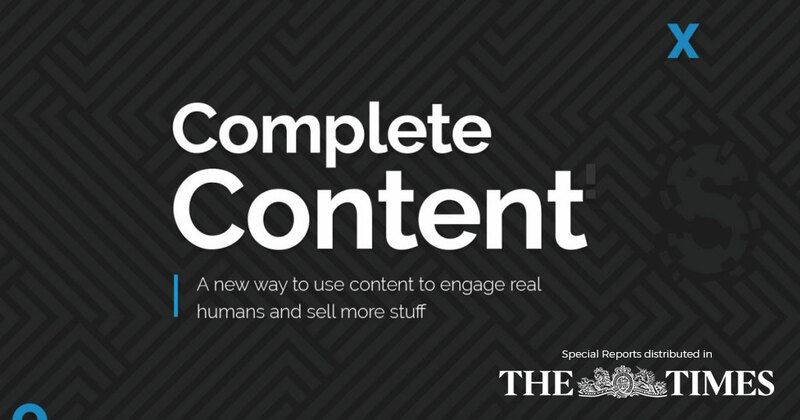 Fill in the form now and be one of the first to discover the how to use content to engage real humans and sell more stuff!